In this video we will install the required software and set up our machine for .NET Core development. There are 2 softwares that we need to install for .net core application development. I have windows operating system, so, I will be using Visual Studio as the editor for .NET Core application development. You can use any editor of your choice. Depending on the operating system you have, download and install the SDK. The SDK includes everything you need to build and run .NET core applications. The .NET Core Runtime includes just the resources required to run existing .NET Core applications. After .NET Core SDK 2.2 is installed, create a new .NET Core Application. 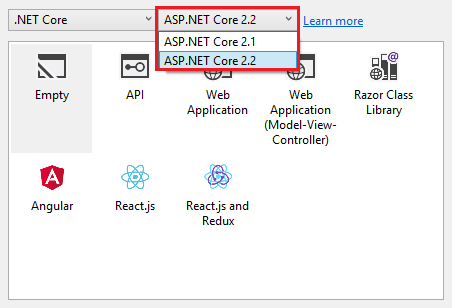 Notice, in the .NET Core Dropdownlist, we now have ASP.NET Core 2.2 in addition to ASP.NET Core 2.1.